Founded in 1919, by Francis Weeks as the Weeks Stevedoring Company. Which started with two cranes in the Port of New York, handling bunker coal, and dry ballast. In the 1950s, the Weeks Stevedoring Company took part in a number of marine projects outside the field of stevedoring. 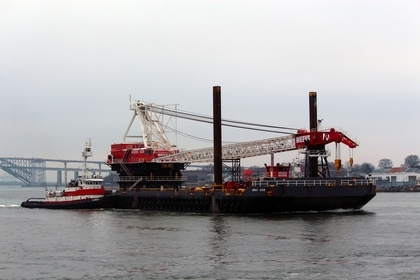 The company performed salvage and dredging work, installed navigational aids for the United States Coast Guard, and constructed a breakwater to protect the air shaft leading from the Brooklyn Battery Tunnel to Governors Island. The company became the prime contractor assigned to remove abandoned wooden vessels for the Army Corp of Engineers, work still contracted today. In the 1970s, Weeks acquired their first dredge, the Venture. A 169(ft) by 41(ft) by 30(ft) hydraulic dredge. The company also acquired their first large tug, the William J. McPhillips. A 105(ft) 2,400 horsepower, single screw tug. Throughout the 1980's, and 1990s' Week Marine acquired the assets of various marine companies. During that time, the company's substantial acquisitions were M.P. Howlett, a New York based stevedoring company. In 1983, Weeks acquired the American Dredging Company. In 1993, and T.L. James, another dredging company based in Louisiana. The Marine Transportation Division of Weeks Marine Incorporated is comprised of hundreds of deck, hopper, and specialized barges in conjunction with a fleet of tugboats. Ranging from 1,000 to 4,200 horsepower. Weeks Tugs work in both, the domestic and international trade. The company's services also include harbor towing, emergency salvage towing, ship assists, and tending and towing for the marine construction and dredging industries.